Kure Beach and Carolina Beach, NC – Exploring a new vacation destination can be daunting, but when it comes to Kure Beach and Carolina Beach, visitors are in luck. Despite their close proximity to one another – they share the same island! – each beach has its own distinct personality. Read on for a list of the Top 10 “Must Do’s” to help first-time visitors make the most of their stay. Whether a lively throwback vacation abuzz with activity tickles your fancy, or a peaceful escape is more your speed, first-time visitors will get their coastal fix at these two beach towns. 1. The North Carolina Aquarium at Fort Fisher – Pay a visit to one of the top 20 aquariums in the country according to TripAdvisor. Discover a variety of aquatic environments and wildlife: touch a stingray, dig for fossils, or spend quality time with a diver swimming with eels and sharks. Make sure to check out the DINOSAURS! exhibit’s life-like animatronic dinosaurs and the Butterfly Bungalow exhibit’s hundreds of exotic butterflies this spring and summer. 2. Fort Fisher State Recreation Area – Touching both the Atlantic Ocean and the Cape Fear River, this park is home to nearly six miles of pristine, undeveloped beach and trails that meander through a salt marsh brimming with 16 threatened and endangered species including hawks, warblers and peregrine falcons. Explore this natural outdoor habitat by hiking the 1.1-mile Basin Trail, or through various ranger-guided educational events and activities. 3. Fort Fisher State Historic Site – A vital port during the Civil War, 10 percent of the original fort is still standing today. Known as the South’s largest earthen fort, the site has added 19 interpretive exhibit panels that offer self-guided historical insight along the site’s ¼-mile long trail. Inside, history buffs can experience new museum exhibits including the legendary 12 Pounder Whitworth Gun, personal effects of Fort Commander Col. William Lamb, and the Medal of Honor earned by Private Bruce Anderson of the 142nd New York Volunteers. 4. Ocean Front Park – Located in the heart of downtown Kure Beach, this public green space features a seaside boardwalk, playground, swings and rain gardens. The park is home to spring events like the Kure Beach Street Festival in April, along free summers like the Boogie in the Park Concert Series and Summer Concert Series. 5. Kure Beach Fishing Pier – Whether you’re an expert or amateur angler, or just want a beautiful place to watch the sunrise, one of the oldest fishing piers on the Atlantic Coast makes for the perfect spot. Buy tackle, bait and rod and reel combos, drop a link, stroll along the 711 feet of wooden planks, visit the concession stand, or play in the old school-style arcade. 6. Carolina Beach Boardwalk – Named one of America’s Most Awesome Boardwalks by Budget Travel, the Carolina Beach Boardwalk is a beloved, vintage icon that has been a fan favorite since 1887. Recently renovated, visitors strolling along the Boardwalk during the summer will find famous donuts (be prepared to wait in line…and bring cash), ice cream, fudge, seaside amusement rides, and live weekly entertainment and fireworks. 7. Carolina Beach State Park – Explore 761 acres of natural beauty – or at least some of them – at Carolina Beach State Park. Discover the distinct habitats of this state park by navigating miles of hiking trails, camping beneath towering trees, learning about the native Venus Flytrap, or casting a line into some of the best fishing spots in the state. The park is also joining in the celebration of the North Carolina State Park System’s 100th Anniversary with celebratory events throughout 2016. 8. Tony Silvagni Surf School – Learn how to “shred the gnar” from the some of the best instructors on the coast, take a standup paddleboard lesson or go on a kayak tour with Tony Silvagni Surf School. Tony Silvagni himself is a Gold Medalist for the USA surf team and has been instructing others in surf technique and ocean safety since 2003. If you’d rather watch from a far, beach rentals of chairs and umbrellas are available. Already an expert? Paddleboards, surfboards, kayaks, bodyboards and skimboards are available for rent as well. 9. Carolina Beach Lake Park – Kayak or paddleboat the 11-acre Carolina Beach Lake Park, once noted in the Guinness Book of World Records as being the freshwater lake closest to salt water. Or take a stroll, jog or bike ride around the path circling the lake. There is a playground, picnic shelter, gazebo and public restrooms on the north side of the lake. The lake is also the site for Carolina Beach’s free outdoor movie series during the summer (family-friendly films only), along with the Pleasure Island Chowder Cook-Off in early April. 10. Freeman Park Recreation Area – Itching to go off-roading? All four-wheelers are welcome on the sand year-round at Freeman Park, located on the north end of Carolina Beach. Bring your furry friend to frolic in the water or sand on-leash from March 1 through Oct. 31. It’s also a popular spot for fishing, crabbing and overnight camping. Do your homework before arriving: camping and four-wheel drive access are allowed with proper permits. Kure Beach, North Carolina’s small wonder, offers a naturally beautiful setting in a peaceful, small-town atmosphere. The coastal community, with its relaxed pace, lets visitors reconnect while they enjoy nature unspoiled and nearby signature state attractions, including the Fort Fisher State Historic Site and the North Carolina Aquarium at Fort Fisher. 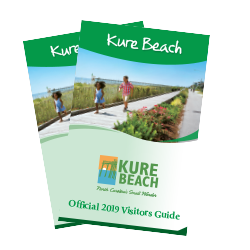 Kure Beach visitors can escape the busy pace of life and embrace the curiosity and innocence of childhood in this pure and natural playground. For more information, go to www.VisitKureBeachNC.com or call (800) 631-1460. Find us on Facebook at www.facebook.com/KureBeachNC and Twitter, @KureBeachNC. Carolina Beach offers the best of a North Carolina beach experience from the past with a fun, family-friendly spin for today. Visitors can experience a vintage, nationally recognized boardwalk, Carolina Beach State Park, one-of-a-kind festivals and events, world-class fishing, miles of beautiful beach, and all kinds of people united by their love of good times that are unmistakably Carolina Beach. For more information, go to www.VisitCarolinaBeachNC.com or call (800) 641-7082. Find us on Facebook at www.facebook.com/CarolinaBeachNC and Twitter and Instagram, @CarolinaBeachNC.